NEW ORLEANS – We’ve reached the end of the road when it comes to National Athlete of the Week in two of the three NCAA divisions (NCAA Division I and NCAA Division III) and both NJCAA divisions. If you haven’t heard of James Sugira yet, you don’t know what you’ve been missing. Sugira has taken the collegiate world by storm in his first year as the native of Kigali, Rwanda announced his presence at the Nuttycombe Wisconsin Invitational back in September when he finished fourth overall. But it was this past weekend at the Ohio Valley Championships where Sugira demolished the field on his way to the individual title. Sugira won by nearly 36 seconds, which is the largest margin of victory since 2004 when EKU’s Jacob Korir won by 47 seconds. Sugira is the second EKU athlete to be named National Athlete of the Week during the cross country season, joining Erick Rotich from 2016. It had been eight long years since Florida last won an individual title in the SEC. Jessica Pascoe wasn’t about to let it be a near decade since a Gator topped the podium. Pascoe surged ahead of Arkansas’ Katrina Robinson over the last kilometer to nab UF’s first individual title at the SEC Championships since 2009. She crossed the finish line in 18:55.0, a full five seconds ahead of Robinson, who finished runner-up. This was Pascoe’s third – but biggest – win of the season. Pascoe also earned individual titles at the UNF Invitational in September and the Mountain Dew Gator Invitational in October. Pascoe is the first Florida Gator to win a National Athlete of the Week honor in cross country. She is also just the second athlete from an institution in the state of Florida to bring the award back home to the Sunshine State. Baron Freeman was named a National Athlete of the Week after winning the individual title at the CIAA Cross Country Championships this past weekend. The freshman took home the individual honors by 40 seconds after posting a 25:52.6 on the 8K course. The Hampton, Virginia, native paced his team to a second-place finish overall. Freeman was also selected as the CIAA Men’s Runner of the Year and is the first athlete in program history to be honored as a National Athlete of the Week during the cross country season. After capturing her third consecutive individual CACC championship, Kendall Fitzgerald was named National Athlete of the Week. Fitzgerald won the title with a 18:58.8 showing to become just the second athlete in conference history to win the individual crown three times during a career. What made the performance even more impressive is that she defeated the field by nearly a full minute. The junior becomes the first athlete in Post history to win a National Athlete of the Week during the cross country season. Eric Herrmann continued his strong season this past weekend at the Centennial Conference Championships. Running in adverse conditions, Herrmann broke away from the pack with less than two miles to go and captured the individual title in 25:13.5, five seconds ahead of the runner-up. Herrmann was the first Dickinson male athlete to win the individual title since Greg Leak in 2009. This was the third win in a row for Herrmann, who also notched victories at the DeSales Invitational and the stacked Connecticut College Invitational two weeks ago. Herrmann is the first Red Devil to be named National Athlete of the Week during the cross country season. He is also the first male athlete from the Centennial Conference to be honored. Of Note: We would be remiss if we didn’t applaud the efforts of Haverford seniors Graham Peet and Dylan Gearinger from the same meet. Peet and Gearinger, who were third and fourth Fords to cross the finish line, ran gutsy races to propel their team to a one-point win over Johns Hopkins, the slimmest margin of victory in conference history. Peet outkicked Johns Hopkins’ Scott Pourshalchi to the finish line by four-tenths of a second (which ultimately gave Haverford the win), while Gearinger pulled away from two Blue Jays down the stretch. Sophia Gorman showed signs of breaking out at the Connecticut College Invitational two weeks ago when she placed fifth in one of the biggest meets of the NCAA Division III regular season. That turned out to just be an appetizer for the sophomore from Charlotte, Vermont. Gorman turned up the heat this past weekend at the NESCAC Championships and brought home the individual title in 21:54.8 – Colby’s first since 1996. It was a near 14-second win for Gorman, who easily beat runner-up Natalie Bettez of Tufts, who has already been a two-time National Athlete of the Week this year. This is the first time that both Gorman and the Colby women’s program has been honored with a National Athlete of the Week award in cross country. David Chelimo captured the first National Athlete of the Week honor for Colby back in 2014. Andrew Kibet picked up another National Athlete of the Week honor after winning the NJCAA Region VI/Jayhawk Conference Championships over the weekend. The freshman had a time of 24:01.8 to collect the meet individual crown, besting the rest of the field by almost 16 seconds. He also helped pace his team to the team title as well. 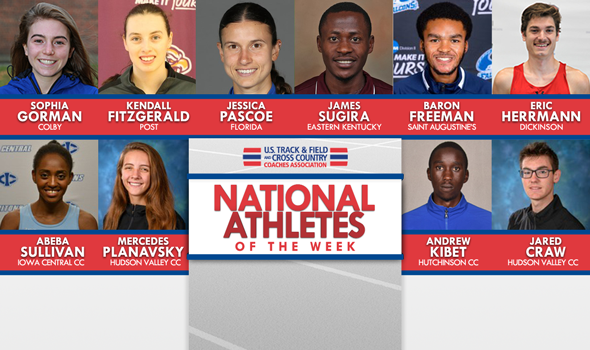 It is the third time this season that Kibet has earned National Athlete of the Week honors. Jared Craw captured his second consecutive National Athlete of the Week honor after he picked up a win at the NJCAA Region III meet this past weekend. Craw won the individual crown with a 30:38.4 performance as he paced his team to the meet team title. The freshman is the only male from Hudson Valley to earn a National Athlete of the Week selection. Mercedes Planavsky earned a National Athlete of the Week nod after winning the NJCAA Region III meet. The sophomore recorded a time of 21:13.2 as she paced her team to the meet title. Planavsky is the first female athlete picked as a National Athlete of the Week in program history.